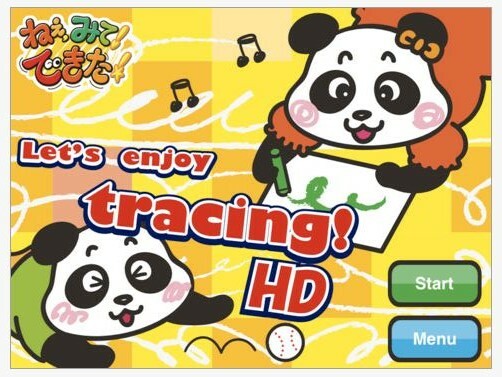 Let’s Trace app is a visual motor integration app for the iPad (.99) that presents simple strokes and shape drawing in a developmental progression. 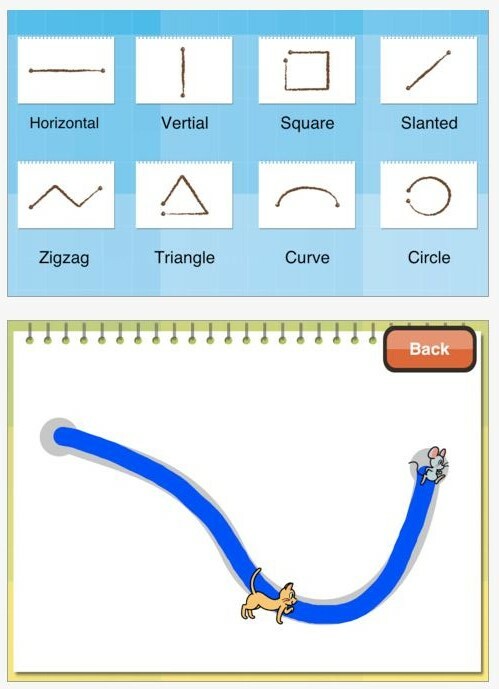 Let’s Tracing app provides visual motor practice for 2-5 year olds learning to trace within lines and draw shapes. Each shape or stimulus provides provides at least 6 practices of drawing the shape in different sizes and orientation. After the user draws, a cat, dog or other creature follows the line from beginning to end providing visual attention to the line of the shape. Applauding is provided as a reward for accurate completion. If accuracy when drawing the lines is not achieved another trial is provided. Tolerance for going off of the tracing line is somewhat limited, however the lines are approximately 3/8″ width to draw on providing a fairly large path to stay within. The app provides the 8 different shapes as shown above with each shape having several trials to practice the task. A back button on the screens allow the user to go back to end the app or try another shape at any time. No settings or options are provided in this app. Music plays during the app, however if unwanted. Turning the sound off is an option. As a basic drawing app, I liked the numerous trials with slight variations provided in each shape drawing practice. A draw back of the app is some of the feedback in the app is provided in writing (Good!! Try again! which is not typically able not fully close. A gap for the circle, square, triangle remains once drawn which provides a poor model of the shape for some of our concrete and visual learners. At .99, this app provides visual motor practice and some feedback for accuracy with staying on the line. Although this is featured for 2-5 year olds, this could be appropriate for students in kindergarten or first grade who are working on pre-writing skills. Let’s Tracing is also reviewed by Angelia Woods, OTR at Advance for Occupational Therapy Practitioners. Check out Angelia Wood’s review her review for more information. This entry was posted in App Reviews, Apps for OT's, Apps for Special Needs, Early Childhood, Education, Elementary School, Fine Motor Development, Focused attention, iPad, Occupational Therapy, Special Needs, Visual Motor and tagged App Review, apps for fine motor, Drawing, Early Childhood, Fine motor apps, iPad, occupational therapy, OT Apps, pre-writing, Visual motor apps. Bookmark the permalink.